After the workshop, Chris and I set a goal of dyeing twice a month for the entire summer and documenting what we learn. We each have different goals in this, but we both want to learn what is available in this area of the country and how to get the best colors from what we have. Our first experiment was with red onion skins, mostly because I have never died with onion skins and I wanted to give it a shot. I have been taking all of the onion skins at the grocery store when I do my weekly shopping and even though I left with a sizable bag each time, it took me 5 weeks to gather enough skins for one dyebath. 215g of onion skins collected in my Grubby, a counter top compost collector given out by the city. I have vermicomposting in my kitchen so this bin sat unused until now, it's perfect for onion skin collection. For the actual extraction, I put the skins in a paint strainer and then large pot of hot water and slowly raised the temperature to the 180-190F, a bit below boiling. Everything I read said to boil the skins, but I am not sure that is good for the color. I have nothing to base this on, but I feel like extracting at the higher temperatures will result in more browning so for this go I decided to keep the temps on the lower side. This might mean that I didn't get as much color and it might result in a different color, that's something I will have to address later in the summer. One last note on the extraction- onion skins smell like onions when you add water (surprise, right?) so they might be best used outside. I really love these 5 gallon paint strainers, they keep all the little pieces together so that you can pull it all out at once and get straight to the dyeing. After the extraction, we pulled out the onion skin bag and put another bag in with the yarn- one superwash, one not. We let everything simmer around 180F for about 35 minutes. As expected, Chris's superwash absorbed quite a bit more dye making it a deep rich brown. Final dry skeins. 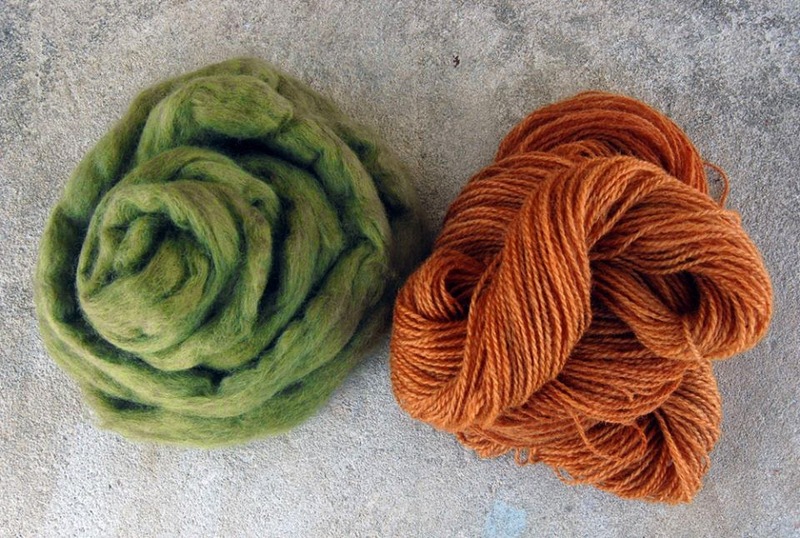 On the left is the regular wool and on the right is the superwash,. When we pulled everything out there was still a good amount of dye in the water so we threw in some wet unmordanted fiber to soak it up. The fiber ended up a khaki brown which was a bit blah so we added some iron to the dye water in the last few minutes which shifted the color to a really nice green. The difference in the two colors is pretty dramatic, hard to believe they came from the same dyepot. Next time my plan is to use a .5:1 ratio of skins to fiber, skip the alum mordant, and follow with an iron bath to try and get a nice deep green, we'll see.